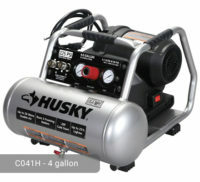 Husky has come up with another unique model of air compressor. 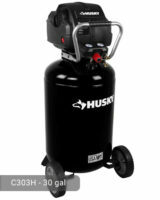 Its Husky 30 Gallon Electric Truck Mount High Flow Stationary Air Compressor was designed to level up the game of air compression both in domestic and industrial settings. 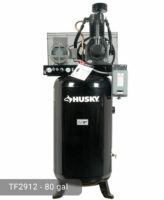 This Husky 30 gallon truck mount air compressor can deliver 18 SCFM of air at 90 psi. Its maximum air delivery is at 155 psi. This level is perfect for both light and heavy-duty tasks. The tank capacity (30 gallons) is enough to perform both household and industrial tasks such as, but not limited to, the following: air brushing, blowing, bolting/wrenching, cutting, drilling, grinding, roof nailing, sanding, and surface preparations. Users can utilize the machine for longer periods of time because the compressor has a metal belt guard which can significantly improve the cooling system of the pump up to 60 degrees Fahrenheit. Other models do not have this feature which makes them more prone to overheating. 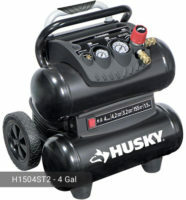 Another distinct feature of this air compressor is its electric-start engine which has an overhead valve (OHV) design. 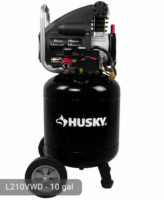 Unlike some air compressors which use the older flathead engine, the engine of Husky’s air compressor has valves which are placed over the cylinder head. Because of this, structure, the air compressor becomes more compact. Also, the drive system becomes less complex making it easier to use and requiring less maintenance. The engine can deliver 9 horsepower which is a very massive power output. The OHV engine has a 6-liter fuel tank and a 3-Amp charging system. The air cleaner features an automotive style. The engine is very safe to use because it has met the minimum emission requirements of EPA and CARB. Husky 30 Gal. Electric Truck Mount High Flow Stationary Air Compressor has a 3-cylinder pump made of cast-iron that contributes to the efficient performance of the air compressor. It is well-lubricated with oil. The pump has an oil level sight glass which gives you a good and reliable view of the oil level. Changing of oil is hassle-free because the oil fill and drain are very accessible. Other features of the pump include the stainless steel flex leaf valves, cast-iron balanced flywheel, and large intake filter/silencers. 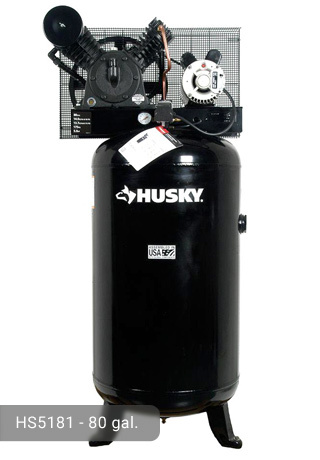 The tank of this air compressor is made of steel so no need to worry about external damages. It has a truck-mount design which works effectively for the functions that it was intended to perform. It has a pressure gauge for better monitoring and control of the pressure level. Although the air compressor weighs 380 lbs. and is heavier than other models, it is still portable. It does not have wheels or a handle because it was specifically designed to be mounted on a good spot in your garage. It will not take too much space but it is larger than other air compressor models with the same tank capacity(ex. C303H Model weights 105.25 lbs). Because of its huge power output, it also requires a 230-volt electrical power source to operate. The machine operates a bit loud with a 90-decibel rating. However, its quick service delivery totally makes up for its loudness. The parts are intricately connected with each other, as can be seen from the outside, to provide a high-quality compressed air. It can power your collection of pneumatic tools including a 1-inch impact gun to remove a semi-truck tire. If you are looking for an air compressor that is guaranteed to give you high-flow of compressed air, this one is for you. Even though it looks complicated from the outside, you can easily learn how to manipulate it because it is very user-friendly. Try it now and see for yourself! 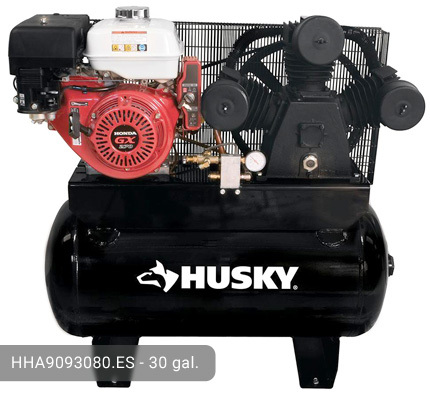 If you already own Husky HHA9093080.ES model or just want to buy it, feel free to share your review or ask a question through the form below.